[editor's note: The Clarke Historical Library News and Notes blog has a new way of delivering our postings to you via RSS feeds or e-mail subscription. Please take a second to look at the subscription options on the right side of this webpage. If you already subscribe to the blog, please resubscribe using our new options. The Clarke Library celebrated President’s Day, February 20, with an exhibit of presidential autographs, lent to the library for the celebration, and a presentation by myself about presidential elections. Going negative, whether by the candidate or more likely the candidate’s surrogates be it a partisan newspaper or a well-funded super-PAC, is an old game first observed in the election of 1800. It may not be a particularly uplifting part of presidential campaigning, but its presence does not necessarily indicate the hopeless downward spiral of the nation. Sometimes both the candidates are seriously flawed, such as in the election of 1884, but the system has coped with the problem before and survived. If in the end voters aren’t thrilled with either alternative, there will be a next time. There is no magic technology to improve elections. When pundits suggest that somehow the internet will renew the process, it probably isn’t true. In the twentieth century the nation has been there and done that with both radio and television, and it didn’t work. Primaries may be endless exercises in trivial retail politics and these days with more debates than even the most committed political junkie can listen to, but they have become the indicator we use to test the viability of each person who seeks the job and, in however clumsy a way, to pull the selection of presidential candidates away from party professionals and place it into the hands of the voting public. Original signatures of America's presidents will be on exhibit in the Baber Room from the evening of February 20 through February 22. Tonight, on President's Day, Clarke Historical Library director Frank Boles will discuss the history of presidential elections at 7:00 p.m. in the Baber Room. A reception with light refreshments will follow. Below is brief sampling of what you can see in the exhibit. With the Spring Semester in full swing, the Clarke Historical Library is gearing up for several exciting events. This is the last week of our Student Life and Learning at CMU exhibit. If you haven't seen it, make sure to stop in before we close on Saturday to see this exhibit. 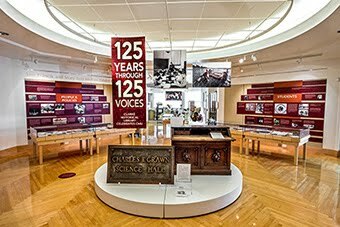 In honor of President's Day, the Clarke Historical Library will be sponsoring an exhibit of presidential autographs and an accompanying presentation. These autographs, from our first 43 presidents, will be available for viewing in the Baber Room of the Park Library from February 20 - 22. On the evening of the 20th, Clarke Historical Library Director Frank Boles will discuss the history of presidential elections. The founding fathers probably would not have been pleased about how the process played out. The presentation and reception will take place in the Baber Room, with the presentation beginning at 7:00 p.m. Finally, we will soon be welcoming our new exhibit, A Delightful Destination: Little Traverse Bay at the Turn of the Century. 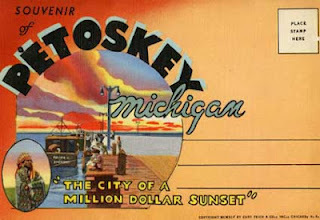 In 1900 tourists and season residents flocked to waterfront communities around Little Traverse Bay including Petoskey and Harbor Springs. Luxury hotels opened serving fresh oysters and lobsters. Railroad and steamship companies created elaborate advertising campaigns that rival the current Pure Michigan program and an economy and way of life still visible today were created. Through vintage maps, photographs, books and postcards, A Delightful Destination: Little Traverse Bay at the Turn of the Century explores the region’s transportation, cultural, and economic growth during this colorful period between 1890 and 1920. This exhibit will run through May 31. To open the exhibit on February 29th, award-winning author Michael Federspiel will discuss the history of tourism in the first years of the Twentieth Century in and around Little Traverse Bay. This event will take place at 7:00 pm in the Park Library Auditorium with a reception following in the Clarke Historical Library. For a list of all of our presentations and exhibits, follow this blog or download our schedule of presentations via this link (scheduled events may change, so please check the schedule to stya up to date). [editor's note] Remember Clarke Historical Library News and Notes readers, we have a new way for you to follow our blog via RSS subscription or e-mail subscription. These new options can be found on the right side of the page. And if you already subscribe via a reader, please take a second and resubscribe using our new options. Only when we post something new to the blog will you receive an e-mail or an update. 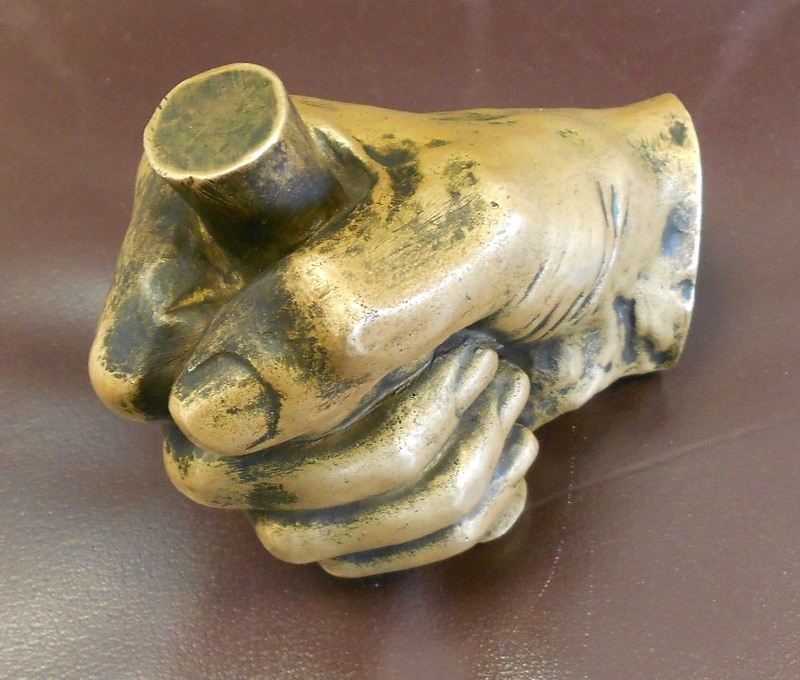 In honor of Abraham Lincoln's 203rd birthday this Sunday, we have pulled out one of our favorite artifacts, Honest Abe's right hand. 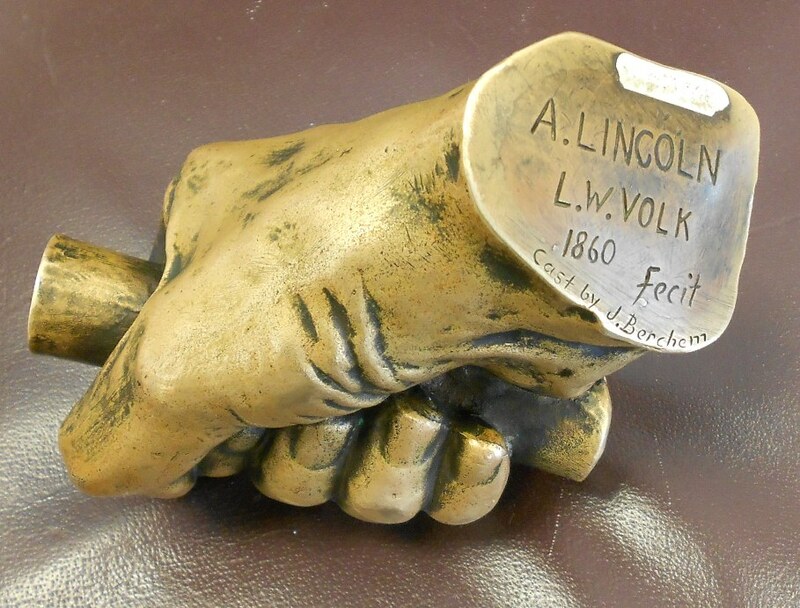 The mold for this bronze cast was done by Leonard Volk in May of 1860, the day after Lincoln accepted the nomination to run as the Republican presidential candidate. According to lore, Lincoln had shaken so many hands on the day that he was nominated, it caused his right hand to swell and prevented him from holding it steady. When Volk arrived to create the casts of Lincoln's hands, he found that the right hand was shaking too much to produce a good piece. It was suggested that Lincoln find something to grasp onto and the story goes that Lincoln found a broom and sawed off the handle to act as a support - this piece of wood is visible in the cast. Using the mold produced by Volk, bronzesmith Jules Berchem produced the bronze cast that is in the Clarke Historical Library's holdings. Volk's hand casts and his life masks of Lincoln are considered some of the finest of any U. S. president and were used as the basis for the Lincoln Memorial in Washington D. C. So in celebration of President Lincoln's 203rd birthday, we share this nugget of history that can be found at the Clarke Historical Library. [editor's note] Hello Clarke Historical Library Readers. We have a new way for you to follow our blog via feeds or e-mail. Check out the options on the right side of the page to subscribe via an RSS reader or via e-mail. If you already subscribe via a reader, please take a second and resubscribe using our new options. Remember, when you subscribe you only receive an update or an e-mail when we post something new to the blog. Charles Dickens, a beloved author, was born 200 years ago, on February 7th, 1812. Many of his novels have reached literary fame, and the Clarke Historical Library is one of the many places in which you can find them. At the Clarke, we have first or early editions of some of Dickens’ works among the nearly 50 volumes of Dickensian literature in our holdings (click on the image for a closer look). A Child’s History of England is a set of three books, published one a year between 1852 and 1854. Dickens covers English history from 50 BC to 1689. He wrote this set of books for his children in the hopes that they would continue to read about history. Sketches of Boz is a collection of short pieces put together and published in 1836. The book is broken down into sections - the first three comprise of non-fiction stories while the fourth section is fictional stories. The Dickens’ Christmas stories began with A Christmas Carol in 1843. It is one of Dickens’ most widely-known novels. It tells the story of Ebenezer Scrooge who is visited by the three spirits of Christmas. Through encountering these ghosts, Scrooge makes a miraculous transformation and gains new value for his fellow man. Dickens wrote the story by drawing on his own personal experiences from his childhood as well as his sympathy for the poor class. The Chimes (1844) is a short novel that follows a young man who loses his faith in mankind’s ability to improve and strive for better. One evening he climbs the bell chamber at the local church and is met by goblins, the keepers of the bells, who show him visions of what will happen to his friends if he does not show them that they can make something better of their lives. Written after the success of A Christmas Carol, The Chimes gained a great deal of interest and remained quite popular for a time, but it paled in comparison to the success of A Christmas Carol. In 1845, after The Chimes, Dickens wrote The Cricket on the Hearth and it is the third book in Dickens’ Christmas stories. It is a story of love and a small cricket who acts as a guardian angel of a home. The Battle of Life written in 1846 is another of Dickens’ Christmas stories. This is the only Christmas story that does not have supernatural involvement or an extreme religious component. The story takes place in a village that sits on the site of a historic battle and focuses on the lives of the people that live and struggle there. The Battle of Life never received much fame, and neither did the final Christmas story, The Haunted Man (1848). The Haunted Man follows a chemistry teacher who wishes to forget the past wrongs that have been done to him. A spirit appears and grants his wish, but afterwards the teacher becomes constantly enraged due to an unknown cause, which then spreads to all those around him. The moral of the story is that it is important to remember the pain of the past because it helps people mature. On this day, 200 years after the birth of Charles Dickens, the Clarke Historical Library looks back and honors this great author and we remind you that these and other wonderful literary offerings can be found in the Clarke Historical Library.